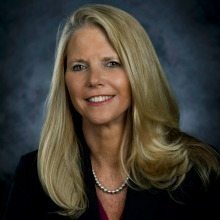 GTL has tapped Deb Alderson, a government services executive who previously was CEO of Sotera Defense Solutions, as its chief executive. Alderson’s first day in her new role was April 2. She takes over for retiring GTL CEO Brian Oliver. GTL board Chairman Michael Sand thanked Oliver for leading GTL through a period of growth and transformation, and his work in ensuring a smooth leadership transition as he moves to an advisory role. Sand added Alderson was the right person to lead GTL, and continue the company’s technology leadership. GTL provides correctional technology services including inmate telephone systems, visitation management software, jail management systems, inmate tablets, and inmate education services. Before Sotera, Alderson held leadership roles with SRA International, SAIC and Anteon. She was honored with a Federal 100 award from Federal Computer Week in 2011.